Jensen Buchanan, photo via Santa Maria Times. Buchanan, charged with felony DUI in a head-on collision just outside Buellton in May, pleaded not guilty in Santa Maria Superior Court on October 14. 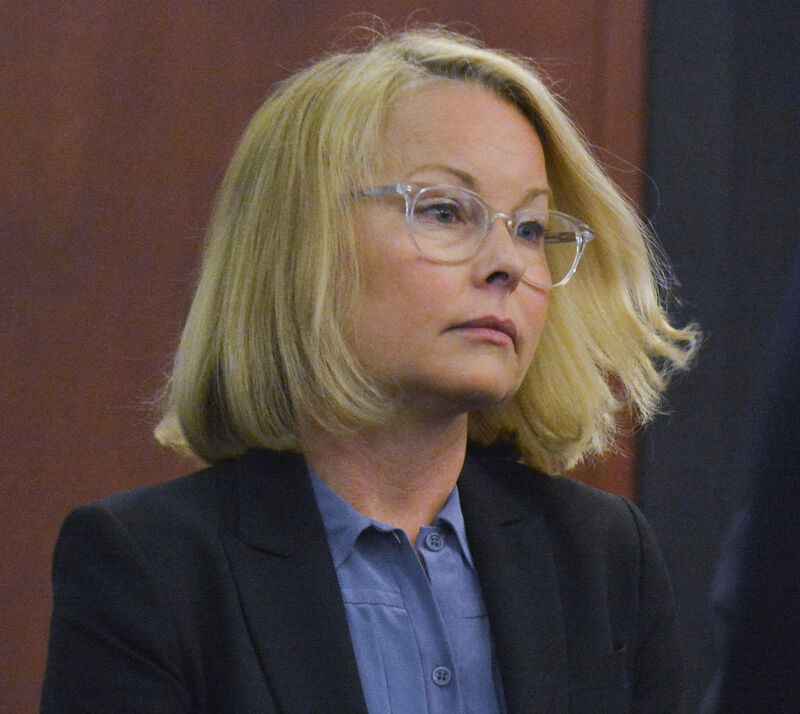 Buchanan (Vicky on Another World, Sarah on One Life to Live, et al) appeared with defense attorney Meryl Chambers, who entered a not-guilty plea on behalf of her client. Deputy District Attorney Tiffany Dix is prosecuting the case. Judge Patricia Kelly ordered the actress to remain at the sober living facility and continue wearing the SCRAM (electronic monitoring) bracelet on her ankle until further review next month. Before he was a tech titan worth $70 billion, Bezos said he spent his childhood summers on a ranch with his grandfather watching the soap opera Days of our Lives. The upcoming trial is set to take place on April 17, 2017, and Rowell is confident that she’ll be pleased with the outcome. “I believe that I will prevail,” she says. In partnership with Ulta, Ellen DeGeneres asked the recent Young and the Restless alum up to get hit with water balloons during Thursday's episode of her daytime talk show, all in the name of breast cancer research. The objective was simple—Hartley sat tight in a chair while DeGeneres and her other guest, Oscar nominee Rachel McAdams, took turns pulling sticks from a Jenga-styled contraption. As they pulled out the sticks, the balloons began dropping on the Hollywood hunk's head. Watch Hartley's appearance on Ellen below. Johnson, a story lead for Pocket Gems’ Episode Interactive mobile gaming app, spoke to students about her career on October 10. During her career, Johnson worked her way up from an assistant to the vice president of programming and talent development for ABC Daytime for almost 20 years. She wrote for All My Children and oversaw One Life to Live. Product placement has been popularized in the entertainment industry these days to boost promotion. This often happens between shows or films under the same mother company to help endorse a certain product. As for the unexpected Doctor Strange mention on General Hospital recently, viewers slammed the crossover for being totally irrelevant and obvious. In a conversation of Ned Ashton (Wally Kurth) and Olivia Falconeri (Lisa LoCicero) where the former expressed his sweet talk to the latter saying "I missed you," Olivia blurted out, "Well, Dr. Strange is about to hit theaters pretty soon." The conversation went on with Ned saying, "You may be surprised to hear this, but if I can't see that movie with you, I won't see it." The scene ended with Olivia kissing Ned. GH airs on ABC, which is owned by Disney, which owns Marvel, which is distributing Doctor Strange. McCrary (formerly Malcolm on Y&R) has booked a recurring role opposite Queen Latifah in new Fox series Star, created/executive produced by Lee Daniels and Tom Donaghy. Set in Atlanta, Star revolves around three talented young singers (Jude Demorest, Ryan Destiny and Brittany O’Grady) who navigate the cutthroat music business on their road to success. McCrary will play Otis Leecan, a nasty piece of work who’s obsessed with his foster daughter Simone (O’Grady). He will do everything in his power to drag her back from Atlanta after she runs away. He’s clever, manipulative and dangerous. But he’s met his match in Simone and her sister Star (Demorest). "There was something that happened when I turned 25, and I got a job in New York on that soap opera [Loving]. It wasn’t necessarily the soap opera that did it for me, it was the timing. I felt like I crossed a threshold. I felt like I belonged, that I wasn’t fooling anybody and deserved to be there. Even though that’s the Joe Stuart period where [the Loving producer] fired me unceremoniously. But even then, as you saw, I was licking my wounds, and I went to Central Park and saw the marathon and felt, I’m going to do this next year. And I did." Called In the Dust of Night, Hamm and Fallon played two friends and business partners who always find themselves in dramatic situations – usually ones that involve a cheating scandal with Fallon’s girlfriend. What truly separates this from other soap operas, though, is the turtle riding around the set in a toy car during takes. Weet-Bix, which is known as Nutri-Brex in China and U.K., is a cereal in the form of a biscuit. The cereal, which is highly popular in Australia and New Zealand, has been on the shelves in China for eight years. It was only with its appearance on the popular Chinese soap opera Ode to Joy earlier this year, however, that millions more discovered the brand, spurring demand that emptied local supermarket shelves. "We were doing okay then but then along came this opportunity and we just saw this huge spike in sales," Mark Roper, international business manager at Sanitarium Health & Wellbeing, which produces Weet-Bix, told CNBC's Street Signs on Wednesday. Boylan's credits included two daytime soap operas: The Secret Storm (playing Katie Logan) and As the World Turns. He Stars in a Spanish-Language Soap. Why Is He Driving for Uber? Pablo Azar, the green-eyed Mexican telenovela star, stepped out of a limousine and walked down the red carpet at an awards show here last year amid the usual celebrity mayhem. Cameras flashed. Fans shouted. Azar, 34, smiled broadly and walked inside. But after the awards show, Azar did something his army of admirers would never have imagined: He changed out of his suit, climbed behind the wheel of his car and started his shift as an Uber driver, a job he relies on when he’s between acting gigs to pay his bills. Azar's credits include Reina de corazones and Marido En Alquiler. The beginning of a recent Netflix Latin America ad explained to viewers that the streaming content company has just parted ways with Mexico’s main television station, Televisa. The video showed a preppy-looking young man with slicked-back hair, buttoned-up shirt and a high-pitched voice. He looks devastated. A young woman walks into the room. — What is it, my love? Why the long face?